After plugging LibraryThing twice this weekend and mentioning that it would be even more awesome when Collections was released, I was excited to find out today that it was rolled out to all members yesterday. LibraryThing is, by its own description, "a home for your books." It's a book cataloging site that makes it possible for you to keep track of the books you own, the books you want to own, the books you have read, and the books you want to read. Essentially, any kind of list or grouping of books you can imagine, you can track using LibraryThing. In fact, the site is so great at what it does that it's been adopted by, guess what, libraries! It also has a social networking aspect, allowing you to browse the catalogues of members who have public libraries, and showing you what books you have in common. There are even efforts underway to catalog the books of famous individuals, so you can find out what books you have in common with C.S. Lewis or John Adams. I suggested it to my mom as a way her sewing guild members could let each other know what craft books they have. I think it would be great for a church library (my church runs a school, so I think they're set...). I also think sharing your catalog with friends or family could be a great opportunity to obtain some of the books you're looking for. It's like a less crass version of sharing your Amazon wishlist, at least for those of us whose wishes are shelves and shelves of books. During college, I developed the two-pocket pat. My ID went in my back pocket, my keys went in my front pocket. That was all I needed. Then I graduated and got married, and I needed something more grown up than the wrapping paper wallet I made to keep my driver's license and whatever cash I had on hand. I got a grown-up wallet like I remember my mother carrying--one big enough for a checkbook. But then we opened another checking account, and suddenly I needed a checkbook cover. Especially since it was confusing my husband when I used the vinyl cover from another bank. 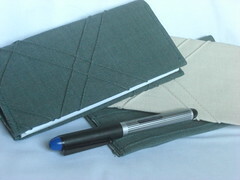 So...the checkbook cover. I used the tutorial from CrazyMomQuilts. This requires a sample 7"x13." These were just large enough! There are a couple of larger pieces of this fabric, so maybe I'll end up with a bag and matching checkbook! 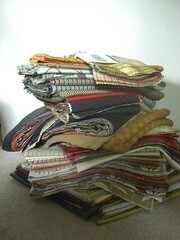 As mentioned in a previous post, I have a stack of upholstery samples to turn into whatever I can dream up. So over the next couple of weeks you'll be seeing where those dreams take me. The sizes range from several inches square to several feet square. There are some lists out there on the Internet making some suggestions about potential uses for samples, but most of them don't move beyond the basic tote bag and pillow ideas. So I'm going to see what I can come up with. Hold on to your hat!